A Halloween fairy party theme is a great theme for a Halloween party. There are many different Halloween craft ideas that are appropriate for a fairy Halloween party or even great as decorations for a fairy party theme for a birthday party. Naturally, when hosting a Halloween fairy party, you will need some planning regarding the Halloween crafts you’re going to make. The plans can be extensive or simple, depending on how much you are willing to spend for the party. 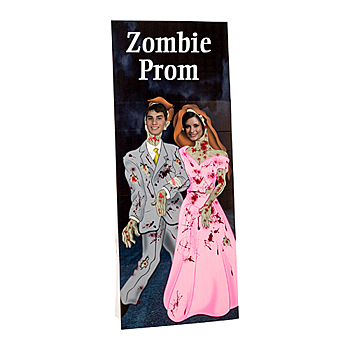 Any kind of Halloween craft idea can help to ease the expenses. Both kids and grownups consider fairies as exquisite light creatures which are graceful and that sparkle. For this reason, you’re going to pin light gossamer cloth to the ceiling so that they drop to the ground – or halfway for an easier access to the room. Such lighting will provide the base of the fairyland you’re going to create. For an improved effect, you can glue or attach sparkling sequins or rhinestones to the base of your Halloween fairy party ceiling decor. 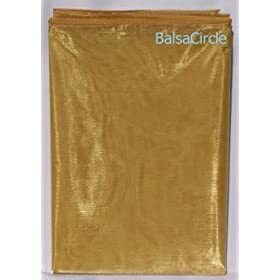 In case you do not find light gossamer cloth, you can use some net lights or fairy lights; which you will find in any good Christmas light retailer merchant or even in online stores. The best way to create a fairy decor in the rooms where you’re going to host the Halloween fairy party, is to get some thin chiffon or organza. Organza is a very light type of fabric which will set up the fairy mood to your rooms right away. Here’s how it should be done: pin some wisps of organza ribbon to the sides of the ceiling or the walls and alternate with pieces of thin chiffon or organza – make sure those are several shades lighter or darker than the ribbons. For a greatest effect, repeat the operation several times in the room. For the finishing touches, you’re going to get some falling or floating fairy ribbons which you will decorate with smaller rosettes or daisy like flowers so that you provide your fairy decor with a garden aspect. For such Halloween fairy decorations, you will want to use silf flowers or paper flowers. Among the long list of wonderful Halloween fairy party decoration ideas is the one of decorating your walls with vines on which you can stick and/or glue fairy flowers and leaves. Vines can be either left after the party (and be used for Thanksgiving and even Christmas, as decorating base) or removed, depending on the method you used to secure them on the wall (glue gun for example). That type of Halloween fairy party decoration idea is probably hard for kids to make but you can ensure the placement of vines and ask the kids to just stick, attach or glue the fairy decorations. 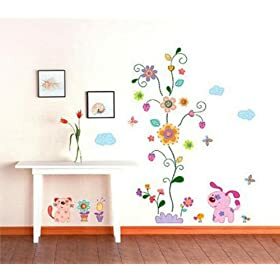 Obviously, you can use vine stickers or ready-to-use fairy wall stickers; which will ease the process of wall decorating and more particularly of removal afterwards. Other Halloween craft ideas for a fairy theme are to put up butterflies, either fabric or print outs stuck to cardboard, from the ceiling. The alternative is getting ready-made fabric butterflies; wich are made out of a very light type of material such as nylon. 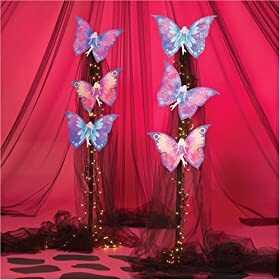 A great way to display butterflies into the room where you’re hosting your Halloween fairy party is to sew them to the pieces of organza you hanged to the wall or from the ceiling. Both solutions will provide you with the impression that butterflies really do fly in the house. 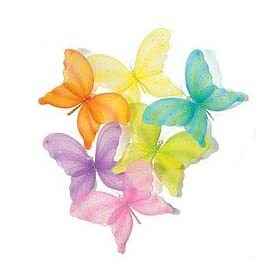 Fabric butterflies can also be placed randomly on tables, chairs and centerpieces if there are any. If you don’t have the time to measure cloth, ribbons and cut, sew and or glue the elements of your fairy decor at home, you can get some ready made accessories, such as this fairy frenzy stand. Be careful as there are small parts which aren’t recommended for kids under 3 years old. When planning a Halloween fairy party – just like with any other kind of party – you need to get an assorted party kit. 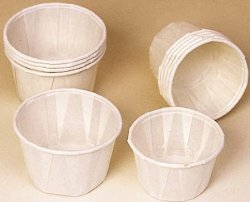 Paper and plastic party kits have two benefits: the first one, they match your party decor; the second benefit is that they allow you to keep away from the dish wash after the party as you’ll just have to throw them away. 8 garden fairy themed dinner and dessert plates, 8 matching paper cups, 16 napkins, 8 assorted invitation cards and envelopes, 1 set of 24 pieces purple cutlery set, 16 pink candles, 1 garden fairy plastic table cover, 1 assorted centerpiece, 1 themed foil balloon, 18 colored balloons (pink, green, yellow), 3 crepe streamers (matching colors) and 3 curling ribbons (matching colors). The tradition in the end of a party is to get your guests a party favor kit; which allows them to get memories from the fantastic day they just spent with your children. The Garden Fairy party kit has the great advantage of providing assorted party favors. Here’s what you get in one party favor bag: 1 garden fairy themed treat bag, 1 garden fairy sticker sheet, 1 fairy lip gloss ring, 1 assorted bead necklace, 1 nail polish set and 1 butterfly wand so that all kids have the fairies’ magic powers. You may prefer to plan a princess fairy Halloween party for your child, instead of a fairy Halloween party. 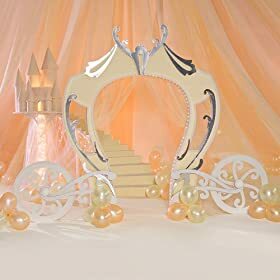 In this case, the Princess Party Theme Decorating Kit is the one you’re looking for! 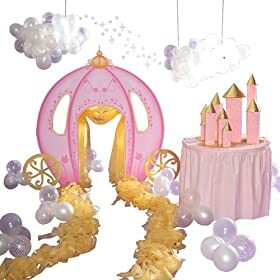 The Princess party kit includes a 5’11″ x 6’9″ x 12″ pumpkin coach kit with yellow gossamer pathway and balloon clusters; 2 balloon clouds with stars kit and a mini pink castle towers kit. The coach features a 41″ cutout door. The set is made out of cardboard and requires assembly. The table isn’t included in the pack. Click the picture to learn more about this fantastic set. If you plan to provide the guests of your kids with food at your Halloween fairy party, I would suggest to bake cupcakes so that you can bring the fairy mood to your table. Indeed, with pull apart cupcakes, you can create wonderful fairy butterfly cupcakes. 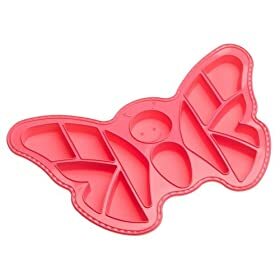 You can do this whether by hand or use a butterfly shaped pull apart cupcake pan such as the one featured here. The cupcakes are baked in their final form and the kids will certainly enjoy the assembly and decoration of the finished butterfly pull apart cupcake. The pan is dishwasher/refrigerator/freezer/microwave safe as well as oven safe up to 500°. Measures 17.75″ L x 11 W” and is made out of silicone. Cleaning: dishwasher. Whenever you do not wish to use a pull apart cupcake pan for the party, you can bake delicious Halloween cupcakes and decorate them with these exquisite fairy cupcake decorations. In this pack, you’ll find 24 floral and striped cupcake liners as well as 24 assorted fairy cupcake toppers with tulle ornaments. 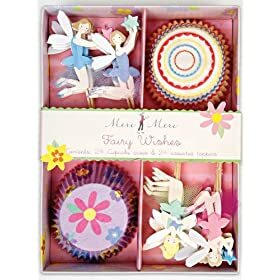 Fairy cupcake decoration kit will match your fairy party kit with perfection. Where to find Fairy Halloween Costumes and Face Paint? Face Paint Heaven is a one-stop resource to the best face paint tutorials; which is managed by a friend of mine. Tagged fairy decorating ideas, fairy tale halloween parties, halloween decorations and props, halloween fairy party, halloween party decorations, homemade fairy decorations, homemade party decorations, party theme ideas.